Contract Status: Lewington is under contract to Washington after signing a new two-year, two-way contract with the Capitals in May. Lewington DOES require waivers to be sent to Hershey. Contract Status: Bowey is under contract with Washington after signing a new two-year deal. Bowey, likely an NHL regular again this season, DOES require waivers to be sent to Hershey. Contract Status: Geiger has taken his game overseas, signing a deal with HC Bolanzo (EBHL) for the 2018-19 season. Contract Status: Johansen is under contract with Washington. This is the second year of his three-year, entry level deal. Johansen DOES NOT require waivers to be sent to Hershey. Contract Status: Hobbs is under contract with Washington. This is the second year of his three-year, entry level deal. Hobbs DOES NOT require waivers to be sent to Hershey. Contract Status: Williams is under contract with Washington. This is the final year of his two-year, entry level contract signed last March. Williams DOES NOT require waivers to be sent to Hershey. Contract Status: Ness is under contract to Washington after signing a new one-year, two-way contract in May. Ness DOES require waivers to be sent to Hershey. Contract Status: Hughes has taken his game overseas, signing a deal with Nottingham (EIHL) for the 2018-19 season. Contract Status: Bindulis is under contract to Washington. This is the second year of his three-year, entry level deal signed last March. Bindulis DOES NOT require waivers to be sent to Hershey. Contract Status: Siegenthaler is under contract to Washington. This is the second year of his three-year, entry level deal. 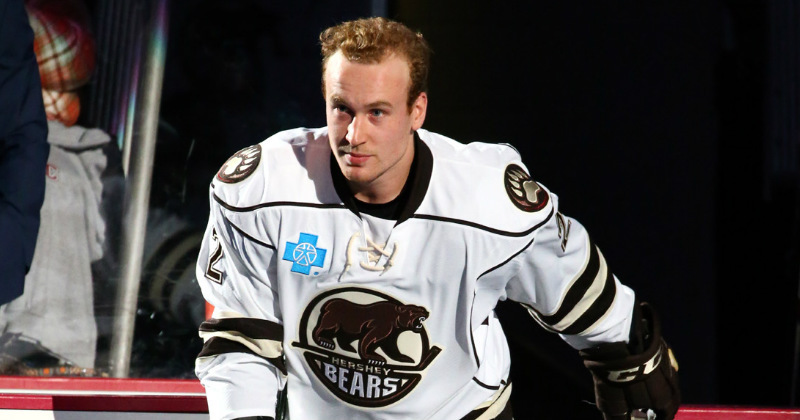 Siegenthaler DOES NOT require waivers to be sent to Hershey.